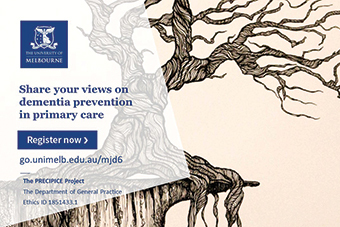 Researchers from The University of Melbourne’s Department of General Practice are seeking GPs, GP registrars and Practice Nurses willing to share their views on dementia prevention in primary care. You don’t need to have any special interest in dementia or preventing dementia. They just want to hear your views and current practices, and the barriers and enablers to working with your patients to reduce dementia risk. Participating in the study involves a telephone interview (up to 60 minutes) at a time convenient to you. Eligible participants can claim the time towards their self-directed CPD programs. If you would like further information or are interested in participating, please visit go.unimelb.edu.au/mjd6 or contact Ms Kali Godbee at k.godbee@student.unimelb.edu.au.